Here it is- March! By the end of this month, I will be at training weekend doing the Wildflower Long Course in it's entirety! We're starting to get prepped for it training wise. The weekly workouts remained about the same...good pool swims..awesome M2 spin class..kick@ss Dailey Method core class and of course our speedy track workout. Ben, Steve, Liz, Mike and their friend Ryan was making me laugh at track because every time I ran by them, they would clap in a standing ovation type of way. Giving Iron respect is what they said but it was funny either way and had me laughing which in return made my "speed" on the track suffer. Our weekend workouts were awesome! 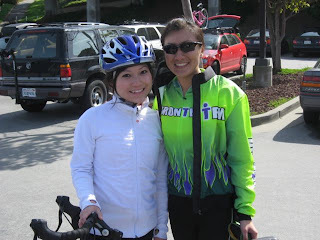 Saturday, we met up at Sports Basement and the plan was to ride 54 miles but at the same time..wherever we were at 10am..we had to turn around regardless of whether we hit the 27 mile halfway point or not. Our coaches wanted to gauge where we were on the bike. 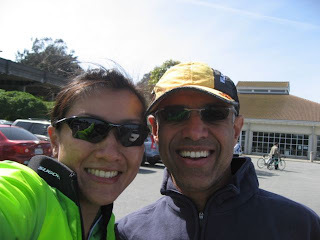 We rode over the Golden Gate Bridge and continued our way to Fairfax to Nicasio. The conditions were windy and the ride was hilly..especially White Hill. I hate that hill! I made it to mile 25 before Raf caught up to me...telling me to turn around. Darn it! I was 2 miles short!! Oh well..didn't feel so bad as most didn't make it to the 27 miles. I was able to ride 49.6 miles of the total 54..not happy about it but content. Seeing the Golden Gate Bridge is always a double edged sword type of feeling. It's great because it means we're almost done with the ride...it's bad because we know that we're going to be riding with a bunch of tourists on rental bikes who aren't always paying attention to the road. I actually "yelled" at a girl telling her that she can't just stop there. She gave me the dumbfounded look..no surprise. After the ride, we put on our running shoes and off we went. It was nice to see some rarely seen faces..Kamal..Kara...Raf..Judy. Below are some pics from Saturday. 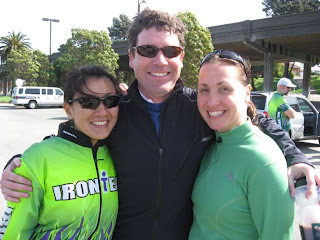 The funniest moment of the ride happened on the Camino Alto climb. I caught up to Raf and Kara after Hez and I got separated from them on a traffic light. Raf said, "Yi..you got fast!" I said,"Raf..you just haven't ridden your bike in awhile." And Kara said, "And I am just fat!" Kara..you're not fat! It was a funny moment. 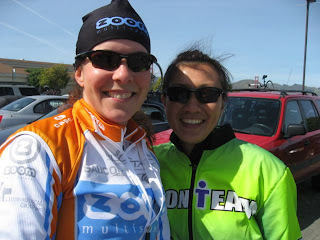 I recruited a new TNT Tri Team member- my friend Nikki has joined the Spring Tri Team! 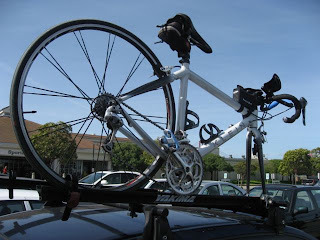 It's hard to find a bike for someone that is sub 5 feet tall! Although she seems to think that she is 5'. That's my baby! Love that bike..notice the baby blue pedals! Myself with Coach Pete and Hez! Sunday was a much dreaded day. It was Aquatic Park day...bay swim..open water. I checked the water temperature in the morning..52.5 degrees! I pulled into the parking lot and wanted to turn around and go home. High winds equaled big swells in the water. I thought.."great! so screwed!" First few minutes after getting in, I was feeling really nauseous from the swell movement but from experience, I also know that the feeling will go away if I just kept swimming..so I kept swimming. After the swim, Hez and I ran together for 100 minutes through the very crowded Fisherman's Wharf and along the Embarcadero to the Ball Park and back. The weather out was gorgeous! By the time we were done with the run, the waters of Aquatic Park was nice and calm. Why couldn't it be like that two hours ago?! I would have swallowed a lot less water! It's a habit of mine to repeat the same song on my ipod when I run..over and over and over again no matter how long the run. Song of this week- Tim Cullen's "The Valentine". Don't ask..it just was :).